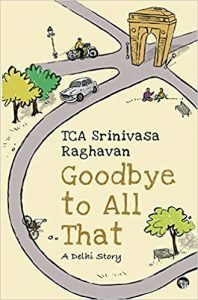 The principal plot of Goodbye to All That: A Delhi Story is not complicated. The young hero, a bachelor, member of the editorial staff of the Delhi branch of a large British publishing firm, has to find three bestselling authors, all of whom must be renowned economists, and get them to write books for the firm, or lose his job. He has a year to find them. Nothing except the prospect of being hanged, says the author in the opening paragraph of the book, can concentrate one’s mind better than the near certainty of losing one’s first job, that too a job that enables one to keep doing things one is accustomed to doing, like smoking cigarettes and weeds, drinking gallons of beer, whisky, gin, vodka and rum in Delhi under prohibition, taking girls to bed, eating junk food, driving around aimlessly, sometimes with buddies, mostly by oneself, reminiscing about a past relationship . . . But don’t get fooled by the blurb and the first paragraph. For the book is much more than what these suggest, very much more. Peel any layer of it and there is another one right beneath it. The book is an onion of a novel. So read it slowly—or maybe a second time—to get its full flavour: of the sinfully money-minded world of publishing (no different from that of, say, selling vegetable oil); of Delhi of the 1970s, now as much a part of history as the days of the Raj; of that history—of the Raj, how and why England ruled India; of the debris England has left behind; of India in the darkness before the dawn of the reforms of Manmohan Singh; of Indian politics and politicians and the ways of burra sahibs; of circuit houses and dak bungalows and travelling by train; of young men and women struggling to find their grooves; of loneliness and brittle relationships; of the roller-coaster that is life . . . Then there are the author’s insights and observations, hundreds of them, incisive, multicoloured, scattered everywhere, like autumn leaves. They tend to get blurred in the rush of rapid reading, as does the humour, sometimes bawdy, often dark, but always guaranteed to produce a chuckle, at least a smile. So put yourself on a leash. Resist the temptation to quickly find out whether the hero will be able find the three economist-writers and save his job; whether he will run into his ex and, if he does, what will happen; whether and if so who of the many women in his life (the world of publishing drawing them like magnet) will he end up with; whether the many subplots in the story will have happy endings . . . Beware of the author’s style of writing, which is economical and fast-paced, almost designed to send you hurtling through the pages. There are only 242 of them. It is no small feat to squeeze so much into such little space. Of course, the author is an experienced writer, skilled at conjuring up pictures with a few deft strokes of his pen, but till now he has mostly written on non-fictional even though weighty matters, specially economic issues (quite like the three renowned economists/writers needed by the hero of the book). Goodbye to All That is his first major step into the trickier world of fiction. It is quite likely that the novel is autobiographical in part. Many first novels are. But to create almost a dozen characters, men and women of flesh and blood, and scores of incidents that ring true—all of them within 65,000 words—is remarkable by any standard for a first time novelist. All the same the reader is likely to finish the novel with an uneasy feeling that it should have been longer, no, not with more adventures after the hero says goodbye to all that (though the ending does leave one wanting to know what happens next between the hero and the woman he is flying out to), but to give more flesh to some of the promising characters and a number of intriguing incidents. The blurb of the book mentions that the novel is not just the author’s first, but also his last, that all that in the ‘Goodbye to all that’ includes writing novels as well. One hopes the author will have second thoughts. He has all that one needs to write great stories—beginning, maybe, with a sequel to Goodbye . . .
Kiran Doshi is the author of Jinnah Often Came to Our House.